What would happen if I added Cascade hops, which give a great burst of floral and citrus to beer, to a bottle of gin? I couldn’t resist finding out as soon as that thought has buried itself into my brain. 15 pellets and a day and a half later it was ready. The aroma was gin plus Cascade. Perfect. Just imagine that background grapefruit pith kick of Cascade. I double strained it to get rid of as much hop trub as possible and my slightly green-tinged hopped gin was ready to drink. I made a G&T and added a slice of grapefruit to enhance the hop flavour, though it didn’t need it – the Cascade shone through the middle adding an extra bitterness and more wonderful aromatics to the drink. Now I want to buy a case of gin and take a load of sealable bags and raid a hop store to see what other varieties could work... I’m thinking Citra or Amarillo, especially flowers, would be great. And I want to try a beer made with all the gin botanicals. Anyone made that? Imagine a wit made with juniper, citrus peel, liquorice, orris, cassia, angelica root (whatever those last three are...), vanilla, caraway, fennel, coriander, cardamom and other delicate herbs and spices and that’s what I want to drink this summer. Photo from Ewan Munro's excellent Flickr account. Some pubs just have something about them. It’s a feeling of coming home, of comfort. It makes you feel relaxed, like you could go any time with anyone and still have that feeling, and it makes you happy to be there. Not many pubs make me feel that way, but jumping on the Central Line to Leytonstone there’s one which does. 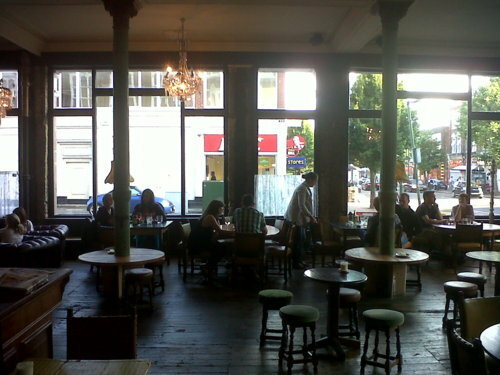 TheRed Lion is part of Antic pub company who have 25 venues around London, mostly in those up-and-coming areas, all the way from N16 to SE27 via E11 and SW17. They share a similar simple worn-cool design and a considered food and drink offer. Before taking the Red Lion over it was called Zulus, a late-night venue, but it dates back to the 18th century as a pub. Leaving Leytonstone tube station, it’s a two-minute walk to find the imposing pub on the corner of the High Road. Outside the huge windows front it in a frame of columns; from inside the windows are even more impressive, giving light and openness. The ceiling is high, the floors are wooden, the tables are unmatched and spread around with some for dining and some for drinking. There’s sofas, board games, bookcases and lots of little details to keep you looking for more. For beer, the first T-bar is given to lagers, mostly big brands, but step further along and it gets more interesting. The cask soldiers all line up with beers from across the UK - Dark Star, Brentwood, Red Squirrel, Thornbridge, Otley and more, then comes another T-bar but this one is of cool craft kegged beer – Punk IPA, Schlenkerla, Odell IPA and more, plus a fridge filled with good world beer. The food looks great, too, mostly simple grub done well. The best thing is the atmosphere. It’s lively but light, fun and open, friendly with families mixing with groups of young guys and girls. The music is excellent, the lighting just right. Everything just works. In many ways, I think this is a template for any new pub. It’s a modern local, the sort that works for those nearby but also pulls people from further away. It’s a nice place to be, the food is simple but well done, the staff are great, there’s very good beer and a good selection of ciders, wines and spirits. There’s also a concession to the less adventurous beer drinkers, but as many pubs have two T-bars, why should they both serve the same branded lagers? Why not dedicate one to better, more interesting beer. That’s the first step in a good direction. I like the Red Lion a lot. Of all the pubs in London, I’d put it in my top 3. Not all beer is good. Some is faulty, some badly brewed, some isn’t to my taste and some just tastes really horrible. Last week I drank some horrible beers. One of the beers was a stout. I expected richness, a smooth body, a roasty depth. I got c-hops and thin, weak coffee (plus some diacetyl...). It was the beer equivalent of a fat 50-year-old dressed up in mini skirt, high heels and plastered in try-hard make-up in that the beer wanted to be something else and failed: it wanted to be an imposing cask stout, highly hopped, stronger than you’d usually see, but it just didn’t even get close to being nice. There was also a sub-4% best bitter. Golden in colour, it looked good, but it tasted disgusting – probably the worst beer I’ve had this year. I can usually tolerate or suffer through beers I don’t enjoy (I did with the stout, just about), but not this one. The first sniff made me wince. It was like I’d pressed my face into a herd of cows. A mouthful was fine to begin – the condition was excellent – but the taste was just unreal. Have you ever tasted hopped wort? It was like that minus all the sweetness. I love hops but this was bitter beyond pleasure and there was no sweetness, no malt character at all, to balance it. As these were drunk in a decent venue, the staff presumably tasted the beers so they knew what they were serving. The beers were both well kept – no complaints there. They had that little snap of natural carbonation, they had life, they kept their foam throughout, and even though taste is subjective, I struggle to think that anyone could’ve enjoyed these beers and gone back for more. And it leaves me thinking... If I ran that place and I put those beers on the bar, would I continue to serve them after tasting them or would I pull them off the tap? How much responsibility should the bar/pub have on serving beer like this? It damages what I think of the place as well as the breweries. But what can they do? Make the call that says they don’t like the beer or serve 70 pints of it and hope for the best? As the only fault is the flavour, then can the customer return the beer and ask for something else? When a bad beer gets to the pub then who should deal with it and how? 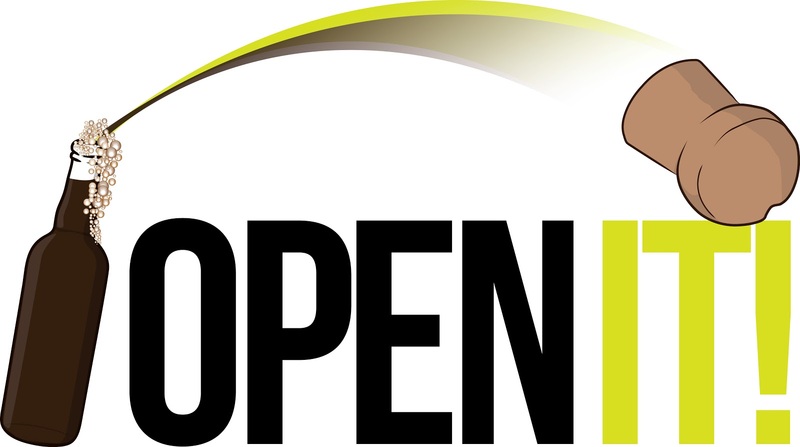 For Open It! I went out into my garage, rummaged through boxes, um’d and ah’d, picked out bottles then put them back again and then picked out some more, finally settling on two beers: BrewDog AB:01 and Courage Imperial Russian Stout. 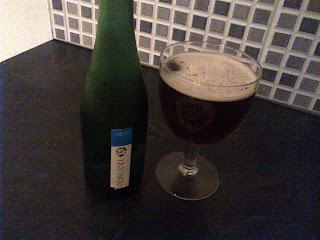 BrewDog AB:01 is a quad made with Westvleteren yeast and infused with vanilla bean. I drank it ages ago in a blind tasting with other similar beers and it was easy to pick out of the line-up. That was over a year ago and it’s changed a lot since. If you were going to recreate this in food-form it’d be banana bread topped with figs and drizzled in a rum, pepper and vanilla syrup, which sounds totally delicious, right? There’s some boozy warmth, a very peppery, dry bitterness, some cocoa and vanilla, plus loads of mushy banana. I drank it really quickly trying to work out whether I loved it or not and usually speed-drinking is a good sign. Occasionally time warps things in weird ways and this is one of them and I loved it. 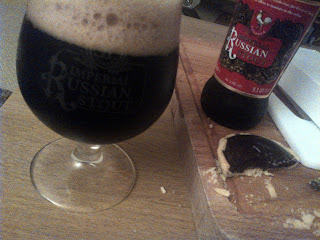 Courage Imperial Russian Stout is a recreation by Wells and Youngs of the beer last brewed in London in 1982. This one was made in May 2011 and released in September 2011, with the whole batch shipped to America except for a few sample gift packs. It looks great – really dark brown with a thick foamy head – and smells great, too, with dark chocolate first then pungent, grassy hops. It’s loaded with flavour but remains light bodied, there’s liquorice, a big bitterness and a flavour which lines the inside of your mouth with hops and chocolate malt. It’s really good. I had it with a dark chocolate tart and that was a massive FABPOW! The great news is I’ve still got another bottle of each stashed away for a future Open It and next time I hope to do things properly just like to drinkers of Leeds did by throwing a massive Open It! party in a few pubs.